her age and weight may give her more stamina to endure the “Fitness Queen” in ten grueling 2-minute rounds. obviously a little nervous, judging by her visage and her bowed head. heart with wings, and a green skirt with a black and green checkered pattern, white trim, and an image of a bull above her name. Her corner man inserts a green mouthpiece into her mouth, massages her shoulders, and encourages her. 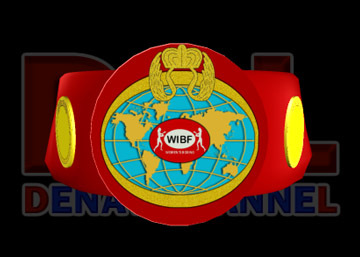 WIBF Junior Lightweight European Championship belt around her waist. 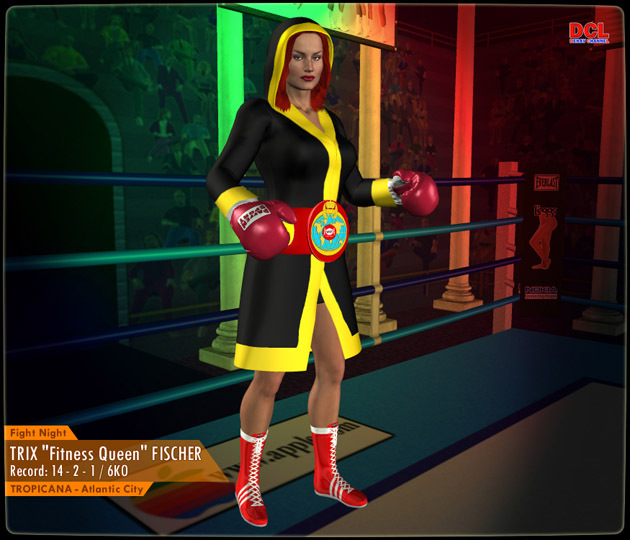 The German female continues to her corner, where she sheds her robe and her belt, showing her red hair, a purple tattoo, black "Adidas"
her fists to tap gloves with Trix, who taps with a single right hand. Both fighters head back to their corners, ready to face each other for the championship. her to block Trix’s straight left with her own right glove. stomach, until, finally, the bell rang, signaling the end of the first round. Both fighters walked slowly back to their corners for refreshment. her corner’s advice well and sends a right jab into Trix’s face. and wait for the third round to start. receive blows, becoming more and more exhausted. With a minute still left on the clock, neither woman has gained any ground. Suddenly, Trix lands a smashing left hook on her opponent’s right side, under the glove guard. with the champion in the center of the ring. Miranda taps into her inner strength and fires off several jabs into the head of the champion. a couple of steps, defending herself well. Behind her red-gloved guard, she dodges to the right, catching a left uppercut to her chin. Dazed, she lowers her guard and fires a right jab at Trix’s head. Staggering back a few more steps, Miranda hides herself behind her defense, trying to endure the last seconds of the round. At last, the bell rings, a relief to her. against Miranda’s right cheek and causing Miranda’s circling right to miss its mark. left hook around her opponent’s weak guard and explodes it into Trix’s right cheek, twisting her opponent’s head to the left. Drastically weakened from the extremely powerful punch, Trix sags against the ropes, about to plunge to the canvas beneath her. and right to evade more blows. The closing bell saves her from any further attacks from this round. jab, Miranda is caught by surprise by a massive right by Trix, and totters backwards a few steps. she makes her comeback; she tries to land a left jab, but is clobbered by a punishing left hook. what they had longed to hear for more than half of the round. Round 6 – Both weary boxers trudge out of their corners, hoping for an easy round. They clinch after a few punches from each other. trying to gain the upper hand. Determined not to be injured further, Miranda crouches and repels the champion with a crunching uppercut. stomach with a hard left hook. backwards. Trix’s left cheekbone starts to swell from one of Miranda’s powerful punches earlier. Instinctively, Trix clinches with her worthy opponent, preventing more punishment, until the sixth round is over. earlier round – sparse action until the last minute of the round. They use some “test” punches as they analyze the other’s defenses. hook that grazes Trix’s left breast. by the champion slams its target, but with less power. Miranda and Trix both stumble backwards just as the seventh round ends. They both relax before another grueling round. and Miranda frantically clutches the fist, to avoid more pain caused by it. of cool water and some parting advice and encouragement. a tremendous right hook to the torso before she even had a chance to defend properly herself. Miranda quickly and wisely clinches with the champion to survive the last few seconds of this round. The bell finally clangs, finishing the second-to-last round. Those intense two minutes must have felt like forever to Miranda Morales. Her fans hope she will have enough strength to give us one last round. Round 10 – Again taking the offensive, Trix bursts out of her corner, her strong determination refueling her strength and energy. the Spanish female’s head to the right. The massive punch does not seem to stop Miranda for even a moment; she is determined to get out of the way of Trix’s powerful blows. her left hook whizzing in front Trix’s head, missing its target. signaling the end of the entire conflict. Both return to their corners before receiving the judgment. continues the announcer. The fans erupt in a mass of cheering and applause, even Miranda’s, because she, at least, gave her best effort. standing on the second rope of one of the corners, triumphant and acknowledging her fans’ support and applause. cheekbone, glad that their ordeal was finally over. Could this be the start of a beautiful friendship? Will they meet in the ring again? Only time will tell.